Tokyo, Japan, September 1, 2017 – Preferred Networks, Inc. (PFN, Headquarters: Chiyoda-ku, Tokyo, President and CEO: Toru Nishikawa) has released the official version 1.0.0 of ChainerMN※1, which is a package adding distributed learning functionality with multiple GPUs to Chainer, the open source deep learning framework developed by PFN. For practical application of machine learning and deep learning technologies, the ever-increasing complexity of neural network models, with a large number of parameters and much larger training datasets requires more and more computational power to train these models. ChainerMN is a multi-node extension to Chainer that realizes large-scale distributed deep learning by high-speed communications both intra- and inter-node. PFN released the beta version of ChainerMN on May 9, 2017 and this is the first official release. The following features have been added to ChainerMN v1.0.0. With this improved stability, ChainerMN can be used more comfortably. 2. Compatibility with NVIDIA Collective Communications Library (NCCL) 2.0. By supporting the latest version, it has become even faster. 3. More sample code (machine translation, DCGAN) is available. These examples will help users learn more advanced ways of using ChainerMN. 4. Expansion of supported environments (non-CUDA-Aware MPI). CUDA – Aware MPI implementation such as Open MPI and MVAPICH was necessary for the beta version, but ChainerMN is now compatible with non-CUDA-Aware MPI. 5. Initial implementation of model parallelism functions. More complex distributed learning has become possible by getting multiple GPUs to work in the model parallelism method. The conventional data parallelism approach is known to limit the possible batch size when increasing the nodes while maintaining accuracy. o overcome this, we have done the initial part of the more challenging implementation of model parallelism for greater speed than possible with data parallelism. These features provide a more stable and faster than ever deep learning experiences with ChainerMN, as well as improved usability. ChainerMN will be added on the distributed parallel environment templates for GPU instances of the pay-per-load public cloud, Microsoft Azure. 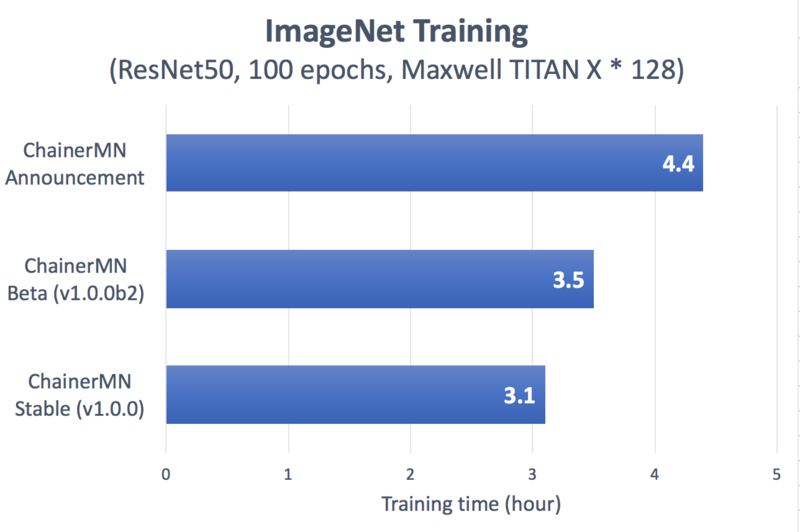 This not only eliminates the need to construct infrastructure required for large-scale distributed deep learning but also makes it easy to manage research-and-development costs. ChainerMN aims to provide an environment in which deep learning researchers and developers can easily concentrate on the main parts of research and development including the design of neural networks. PFN will continue to improve ChainerMN by adding more features and expanding its usage environment.